Thanks appreciate it, will refer to this list when moving to house with fibre. I think I will choose an all in one device, as makes things easier for using with my 12V UPS, I'd probably need two otherwise. Advanced Tomato looks quite nice, do you think that is the best custom firmware? Would love to go the Edgerouter route but as above, trying to keep it simple. Advanced Tomato looks quite nice, do you think that is the best custom firmware? It's based on Shibby's branch of TomatoUSB (http://tomato.groov.pl/), personally I prefer to stick with his version and have been running it for the past few years on an Asus RT-N66U without issue. Wow this is an excellent little product. Its dual core 880Mhz MIPS, more powerful than the Edgerouter Lite and 1/2 the price. Its got POE in, and a POE Passthrough. So if you want to combo it up with a unifi ac lite then yeh that setup would mean you get an amazing little router and can still pop your access point where you want for $99 + $175 + GST. All up $316.10 inc + shipping. 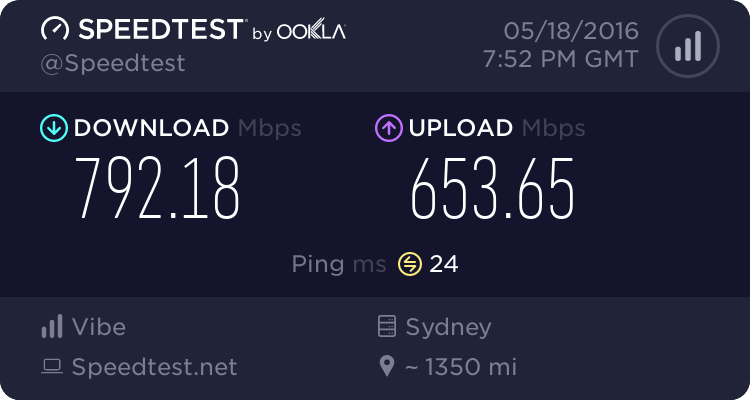 The X Nearly hits the wire speed, a guy here rekons it gets about 850Mbit. Depends on circumstances. Apparently the ERL can perform above 1gbps due to the extra memory and hardware acceleration. Either way for $99 its a great buy. It should be easier to configure than a mikrotik. Is OP saying the HG659 is well-performing device? That hasn't been my experience. I've found it needs frequented reboots and the 5GHz connection is usually unreliable (even from the room he router is in). The older Netgear unit we had before UFB just worked. I wish I hadn't given it away. It is and also a good device for price. There are plenty of people on these forums that have had good experiences. There was a fault with 5GHz WiFi that was fixed with a firmware update that you may have been experiencing. I should grab one and give it a go as they do sound pretty good now! I'll add it to the OP. Any recommendations for a reliable good UFB router for new 1G UFB products being launched on 1 October. I am on Bigpipe. Mainly concerned about range and secondly speed. All feedback welcome - be interested on feedback from Dunedin Gigatown users? I have the latest firmware available from Spark. But maybe you are referring to changing something open source? Would anyone like to recommend an 8 port router for VOIP phones? I have 5 VOIP phones (Yealink) that are working most of the time using a couple of Linksys WRT54 GL I had sitting around. These are fed from my Spark ADSL router. I would like to upgrade to a 8 port router that would hopefully provide more consistent connection. Easy set up would be appreciated and thinking a budget around $300 would be great. Any pointers/ recommendations greatly appreciated. which could power your VoIP phones for you over ethernet so you no longer need to have the power adapters. I assume you would have to connect to ethernet with a gigabit card or connect via 5ghz AC to achieve Gigabit, but what makes some devices suitable and some not? CPU processing power? Routing process?